That is, every CF bat in existence since 2011. DeMarini’s two piece composite design has made considerable strides over that time. And, considering the CF3 was a pretty fantastic bat, the 2018 CF Zen is remarkable in so many ways. Count the following as the beginning of our 2018 Demarini CF… Jump to the full review. We aren’t the only ones to have information about the CF Zen. Other places, in particular those who sell bats, usually have a boiler plate write up on the specs of a bat. Many of those we reference to make sure we are seeing what we should be. Here are some more references for the 2018 DeMarini CF Zen review. That is, every CF bat in existence since 2011. DeMarini’s two piece composite design has made considerable strides over that time. And, considering the CF3 was a pretty fantastic bat, the 2018 CF Zen is remarkable in so many ways. Count the following as the beginning of our 2018 Demarini CF Zen Review. To date we have hit with the CF Zen BBCOR line extensively. Several different players at different skill levels used the bat. We think we have a good feel for where this bat will play well. The bat’s swing weight and feel at contact is what most average to very good players love. The new 3-fusion connective piece gives a real tight feel at contact. The bats performance across the barrel is unbeatable. Late to the USA game, DeMarini’s CF Zen actually did quite well. We were surprised to have such a late coming bat do so well in the market. We heard of no durability issues and performance was positive. The need for a light swinging two piece composite in the USA space is filled well here. If that is you then go for it. As a general rule, you can expect top end performance, a nice balanced swing weight and a super smooth feel in a CF Zen USA Bat. What you may lose in barrel profile (if that means anything at all) should be made up for in top end performance, max sweet spot size and a really great feel on hits and mishits. The USSSA 2018 version of the CF Zen has had it’s ups and downs. The durability of the bat has become an issue for some, but the overall performance of the bat is remarkable. The bat was banned for a short time and then later brought back to life. It was a big cluster towards the beginning of 2018 as things happened during the season. But, now the waters have calmed, and we say jump right in. DeMarini has made slow progress on the CF Zen over the years; for good reason we think. The bat has been a top notch industry setting bat since the beginning of composite and aluminum baseball. Here are our previous reviews on the Zen through the ages.If DeMarini does anything well, it is the ability to deliver innumerable color and style options on marquee bats. Not too many years ago the idea of custom bats was unheard of. And the ability to identify a bat from a distance was something we took a ton of pride in. Today, however, Demarini's numerous iterations take a very trained eye and a slow camera. From DeMarini's Instagram account we took the above image. ​Although it looks ike there are at least 10 different models, the truth is those are just the DeMarini Cf Zen, CF Voodoo Insane and CF Voodoo One. We can't tell, just by the pictures, if that if there are any balanced or end loaded versions of the Insane or CF. But, the point is, there really are just 3 different bats in the above pictures. Granted, a few are the 2018 version, but the custom color options and unique graphics make every angel of those bats difficult to identify. New Things 2017 D-Fusion vs 2018 3-Fusion The most significant change from the 2017 Zen to the 2018 Zen is the change in the connective piece. They removed some bulk in the D-Fusion handle to make it slimmer. It looks odd and really makes the bat look like a corn dog. This new version is called the 3-Fusion. DeMarini makes a CF series of bats in an end loaded version too. They refer to this as a CF Insane. When we started writing reviews 4 years ago, there were only a couple of two piece composite bats in the market. Today, however, there are several. Each trying to get a piece of the pie the CF series and Easton MAKO/S1 series created from scratch. As such, there are several “comparable” bats by way of construction. Two piece composites can be found in Easton’s Ghost, Rawlings’ Quatro, Axe’s Avenge, Slugger’s 918, Adidas’ Aero Burner, Marucci’s Hex Connect and at least a few more. In terms of pedigree and proven performance then the Easton Ghost might be the only true competitor to the CF Zen. Especially in the big barrel or senior league space. Is The CF Zen illegal? We write about that, with specific regards to the 2017 version, in our Illegal 2017 CF Zen article. We’ve hit with the new USA CF Zen no less than 500 hits. Those htis were among several different hitters. We measured the bat’s swing weight, exit speeds and barrels size. 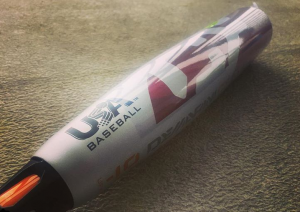 That information, along with experience with other USA baseball bats, puts us in a position to offer some real advice on the 2018 USA CF Zen Drop 10. Our hitter in the video was super impressed with the feel of the bat. In particular, even compared to other two piece composites he tested the same day. 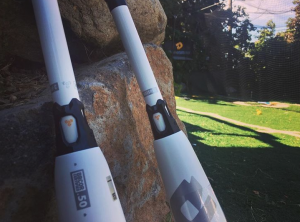 DeMarini has dialed in the 3-Fusion (formerly known as D-Fusion) connective piece. Their connective tech has been top shelf for a long time. We did not measure exit speeds in this session as the bat was yet to be worked in. Check our raw exit speed data for more objective measurements. In the market for a top shelf composite drop 10 USA Bat? Truth be told, you have a lot of good options. It is hard to say the CF Zen is any measurable amount different then the Quatro and Ghost X. We suggest, if feel at contact is your deciding factor then go with the Zen. If you’d like save a few bucks then go with the Quatro. Want the biggest barrel? Then the Ghost X. If you want to try something entirely different then go with MIzuno’s Ghost. The 2018 CF Zen USA Bat is, as expected, a two piece composite bat with a balanced swing weight. It uses the same paraflex composite design DeMarini used in the 2017 line of Zens as well as each of the 2018 CF Zen bats. The connective piece is the 3-Fusion, which is an upgrade from the 2017 D-Fusion in that it serves the same function but with less bulk for other parts of the bat. For 2018, Demarini upgraded their D-Fusion handle connection into the 3-Fusion handle. This feature removes weight from the connective piece. If there were any particular reason to spend your money on the Zen instead of another high end performance bat it would be Demarini’s connective piece. Granted, much of our testing in this regard is subjective. 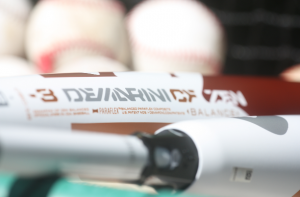 But, we do believe the connective piece design on the Zen (and other top shelf DeMarini bats) is unbeatable. The feel is remarkably smooth on hits and without vibration on mishits. With the exception of the 917 Prime from Slugger in a BBCOR, we know of no other bat that dampens sting as well as the 3-Fusion design found on DeMarini’s flagship bats. After testing exit speeds with our Rapsodo machine we find the CF Zen to be among the best for velocity off the bat. We discuss the major caveats of exit speeds on our hottest bats page as well as the nitty gritty results on our raw exit speed data page. If you are convinced that a bat with a bigger profile is always better than a smaller one then the CF Zen USA Bat is NOT for you. The barrel’s profile size is smaller than average in the space and is smaller than other marquee bats in the two piece composite USA Bat space. However, if you accept the notion that barrel profile has very little to do with actual success at the plate and is not akin to sweet spot size (which it isn’t) then the barrel profile is just fine and will work. The Zen was both late to the party and is short on sizing. At release, it only comes in a 30, 31 and 32. Any other size needs, like a drop 8 or drop 5 or 29 inch bat, are found elsewhere. If you want to stay with DeMarini (and get that smooth 3-fusion connection) then the Voodoo USA will be your ticket. If a two piece composite is your desire then you’ll need to look outside the DeMarini window. Like its many predecessors, the 2018 CF Zen is a two piece composite bat with a big barrel and a balanced swing. It is not to be confused (at least in BBCOR) with the CF Insane which runs about 10% heavier in the swing weight department. The two piece design is connected by a device that helps remove sting from the hands yet still gives it a stiff enough feeling to do damage. The two piece design by DeMarini has always been one of our favorites and they are a real pleasure to hit.